Conventional thinking has it that India with global warming will receive more rainfall. But that need not necessarily be so. Annual rainfall, especially during winter and monsoon, has decreased in over 68 per cent of the country, claims a recent study by Indian Institute of Tropical Meteorology (iitm), Pune. Scientists attribute the decreasing rainfall to changes in the composition of gases in the atmosphere. The study has come up with several observations regarding rainfall pattern in India (see box: Changing wet season). "With increase in greenhouse gas (ghg) emissions, the lower atmosphere traps more energy than before. This reduces the share of energy in the upper atmosphere. While the lower atmosphere, up to 4 km from the surface, faces a warming situation, our research showed that the upper atmosphere, from 6-12 km, is cooling at 0.23C every year," Nityananda Singh, who carried out the study with his iitm colleagues, told Down To Earth. The researchers found that most of India was showing a decreasing rainfall trend, they started recording temperatures at different levels of the atmosphere and found cooling in the upper atmosphere. Cooling in the upper atmosphere was found to be more intense in the Tibetan Himalayan highland area, leading to the weakening of Tibetan anticyclone--a weather phenomenon when the upper tropospheric subtropical anticylone of Asia is centred over southeastern Tibet. A strong Tibetan anticyclone is a prerequisite for monsoon in India. 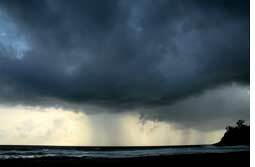 But its weakening is impacting the monsoon, the researchers said. Explaining why cooling is more intense in the Tibetan Himalayan highland, Singh said, "Some Chinese scientists have found that the ozone concentration over this region is declining. This could be one of the reasons but more studies need to be conducted before a conclusion is reached. It could be because of either increase of dust concentration over this region or decrease of moisture." He added that lack of data of the conditions in the highland was posing problems for them to zero in on the reasons that cause the higher rate of cooling there. The study collated rainfall data over 193 years to show that while it has been raining less in more than two-thirds of the country, the trend is opposite in the rest of the country. While most of India including Punjab, north and south Bihar, Bengal, Meghalaya, Narmada valley, Mahanadi basin, Gujarat, Kerala, Bundelkhand Upland show a decreasing trend, Assam, parts of Bengal, Kathiawar Peninsula, Konkan region, Karnataka, Andhra coast and Tamil Nadu uplands showed increasing trends. Among river basins, while the Ganga basin, Ravi, Beas, Narmada, Godavari and Mahanadi showed decreasing trends, the Krishna, Cauvery, Tons, Ken, Tapti, West Coast drainage system and the Subernarekha showed increasing trend. Singh added that though the general trend showed a decline in rainfall, 2008 recorded an increase of rainfall in northern India and most of the southern peninsula suffered drought. He said that this was due to the Tibetan anticyclones moving south of its normal location. The normal location is over the Karakoram range. This year, for most of the monsoon, it was over the Indo-Gangetic plain and northern India. According to Prabhjot Kaur Sidhu, an agrometerologist with Punjab Agricultural University, if the decreasing rainfall trend continues, both rain-fed and canal irrigation would be adversely impacted in the long run and the overall flow of water would decrease. However, she adds, so far, no significant effect of decrease in rainfall on agriculture has been found in Punjab. Sidhu, along with other researchers of the university, studied three decades of rainfall data to come to the abovementioned conclusion. B N Goswami, iitm's director said that one of the limitations of the study was that before 1871, the number of rainfall data recording stations were very few. He said the results could be confirmed if more data were available. "While the average rainfall of the country can be calculated with the help of data (whatever avialable) before 1871, any regional study based on the same data needs further check," he said.